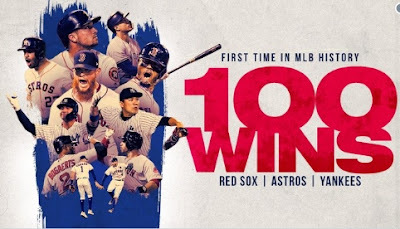 This is the final weekend of the regular MLB season, one that has again been very busy and profitable for readers of this blog, or at least smart readers of this blog who follow my advice. On the field, the drama today is in the National League. In the Central Division, after 161 games the Milwaukee Brewers and Chicago Cubs are tied on 94 wins with a possible game 163 tie-breaker on Monday if the two teams match each other today, and a similar story in the West Division where the Los Angeles Dodgers and Colorado Rockies are tied on 90 wins. Followers of the 'shorties' system, which historically is more profitable early in the season, will have been thrilled with a profit of 74.4 points so far, from a record number of selections, 431 so far compared to 296 last season and 124 just four years ago. While the difference between the best and worst teams in baseball is narrower than in most sports, the gap is widening. This season is the first in MLB's 115 year history with three teams in the same League all winning 100 games or more. Across both leagues, there have been only six seasons where three teams have won 100 games or more, four of which have occurred in the past 20 years. It's likely a trend that will continue, so ride those shorties before the market catches up with what's going on. Over the last five full seasons, this simple strategy is up 96.53 points from 1,082 bets, an impressive ROI of 8.92%. Last season was the best, +55.70 points from 296 selections, 18.81% ROI. With two more days to go, the 2018 season is also up 23.75 points on the Run Line, less than two points short of a combined 100 points which would be very nice. As with the points total in the NBA, when the number of qualifiers starts increasing each season, it's likely that the optimal entry point has also changed. There's also the practical consideration that more selections means more work, so while 74.4 points from 431 bets is great, 51.6 points from 184 bets is a much higher ROI. At one time in my life I was an IT consultant, and while the exact numbers can no longer be recalled as the 1980s were a long time ago, I do remember my agent on one occasion telling me that the client wanted to extend my contract, and that the weekly rate would go from (I think) £800 a week to £850. It sounded reasonable enough until she said that the client were also looking at extending the number of hours I was to work (or at least be present in the office) a week from 35 to 37.5. A quick calculation confirmed my instinct that this actually amounted to a pay cut. I'm not sure the agent ever got her head around the calculation, as she was stuck on the number 850 being greater than 800, but we got there in the end. Something for me to look at in the winter, but rather than using an implied probability of 0.667 or greater as the qualifying rule, it now looks like 0.7 might be better, and forget the super-favourites when they get close to an implied probability of 0.8 as they become over-backed. For those of you wondering about backing 'shorties' in the playoffs, there are not a huge number of games in the sample, just 21 in the last ten seasons (Money Line is +8.55 points and the Run Line is up 1.0 point) and 31 in the last 20 seasons (Money Line is +8.85 points and the Run Line is up 0.85 points). While some sports extend their play-offs to include roughly half of the teams, MLB is a little more selective (10 teams from 30). No MLB team has ever made the play-offs in a full season without a winning record. Compare this with the NFL, NBA, MLS and NHL where teams have all made the play-offs with a losing record. The T-Bone system is also on track for another profitable season but unfortunately you'll have to wait for the final numbers as I'm travelling again for the first few days of October, a combination of a work trip followed by a weekend watching my son running his first marathon. After 19 games without a win, and just one win in their last 37 , the Cleveland Browns finally won again last night beating the New York Jets 21-17. A loss for the Small Road 'Dogs, but a win for the Vanilla Thursday Unders. Looking ahead to the weekend and the opening line for the Minnesota Vikings v Buffalo Bills game has the home team favoured by 16.5 points, an unusually high spread for a Week 3 game, only the fifth at this level in the first three weeks of a season in the last 29 years. As a general rule, oddsmakers tend to wait until around Week 5 to really start setting these huge lines. It makes sense: Five weeks is a pretty fair point in the season to begin trusting a team’s results to tell us what they truly are. Before that, though, it’s difficult to filter out which performances are real and which are just early season flukes. That’s why, on average, the NFL sees a game with a 15-point spread in the first three weeks of the season only once every five or so years. 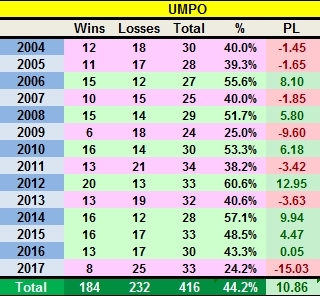 No favourite has lost a game straight up when favoured by 16 points or more since 1995, and while overall the underdogs getting 16 points or more cover the spread 51.4% of the time (37-35-1), when the line is from 16 to 17 points, the favourites cover 57.7% of the time. And when the big line appears in the first three weeks of the season, favourites cover 80% of the time. Go Vikings. There were just the two +3.0 selections from the College Road 'Dog System last Saturday, with one winner and one loser. With a 3-8 weekend overall, this was not its finest hour. 14-18-1 for the season to date. One UK based reader was asking for suggestions on where to place these bets, and the obvious answer is to have Pinnacle available to you. Pinnacle restrict by country, not by nationality, so while this blog would never encourage anyone to do anything dodgy, gaining access to a Pinnacle account shouldn't be an insurmountable challenge for anyone serious about investing on sports. Somewhat related, and it's pleasing, but perhaps a little surprising, that only about one third of hits on this blog come from the UK. The USA is always high on the list, with Sweden, Italy and Australia making up the top five. I guess the UK percentage would be higher if I were to touch on horse racing, but that's not going to happen. Back to sports, and the NFL Road 'Dogs did better than the College ones with five winners from eight selections. Only the one draw in the English Premier League this weekend, another winner for the Little 14 category, but a losing weekend overall. 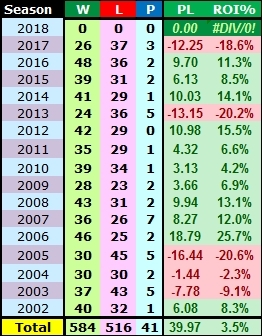 It's still early days, but with just nine draws from the opening five rounds, the record low EPL draw percentage of 2005-06 (20.26%) could be challenged. Serie B has seen a much higher nine draws from just 27 matches, but chaos reigns in Italy now as a court has today suspended the league! The fourth 'Big 6' match of the season in the EPL today, as Tottenham Hotspur host Liverpool. 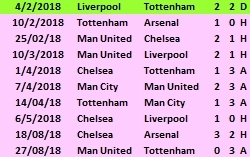 Backing the Draw in these contests since 2012-13 is profitable as readers will know, but the current losing sequence is the longest ever, dating back to February's 2:2 result between today's contestants in the reverse fixture at Anfield. Ten losses followed that game to close out the 2017-18 season, and no luck yet in the first three games of this season. The previous longest sequence without a Draw was eight in the 2014-15 season. If you sensibly ignore matches where the Draw price was 4.0 or higher, the losing sequence is 'only' nine. At least the 'Little 14' system is in profit so far, with an ROI of 24.5%. Seven of the eight draws so far this season have come from this category. Five more qualifiers this weekend. With the Champions League next week, all six big boys are in action today. While the new rule changes have led some to believe games will be higher scoring, I'm not so sure, but it's something to be aware of. There are another seven Divisional games this weekend. As I write this, small 'dogs on the road this weekend are the Colts, Chiefs, Seahawks, Panthers, Giants and Dolphins, with the latter three playing in Divisional matches. Be aware though, that lines move. Another thing to be aware of with these systems is that it is important to keep an open mind on what parameters you use for your selections. As a result of last season's 4-6 record, backing qualifiers at the +2.5 points line now has a losing record overall, with a total loss of 0.17 points. However, not all seasons are equal. Most readers should agree that results from 2002 are less important than results from 2017, so I apply weights to the numbers. This shows that the +2.5 line is currently even more problematic. Over the last four seasons, the record is 15-21, and the weighted record comes out to 35-42. If you stake using fractional Kelly and use the weighted ROI percentage as your edge to calculate the recommended stake, then the recommended stake size on these selections is of course zero. At least for now. Keep tracking these results, and at some point they may again offer value. Another thing about monitoring lines outside of what appears at one time to be the optimal range, is that new opportunities can show up. Bottom line is that while backing Small Road 'Dogs in the 2.5 to the 5.5 point range has been overall profitable since 2002, the basic system can be improved upon with a little effort. A recent obituary from the New York Times by Daniel E Slotnik which might be of interest to some of you who like stories which show that original thinking and a little obfuscation can be lucrative, even if the edges don't persist for ever. Many gamblers see roulette as a game of pure chance — a wheel is spun, a ball is released and winners and losers are determined by luck. Richard Jarecki refused to believe it was that simple. He became the scourge of European casinos in the 1960s and early ′70s by developing a system to win at roulette. And win he did, by many accounts accumulating more than $1.2 million, or more than $8 million in today’s money — until, that is, the casinos finally found a way to eliminate his edge. But no matter. By then he had filled his pockets and achieved a level of celebrity and was on his way to carving out a career in another arena of risk-laden wagering back in the United States — as a commodities futures trader. He died on July 25 at his home in Manila. He was 86. His wife, Carol Jarecki, said the cause was pneumonia. That look concealed a keen eye for detail and a sharp mathematical mind, which Dr. Jarecki first turned to the problem of roulette in Germany in the early 1960s. He and his wife honed his technique at dozens of casinos, including in Monte Carlo; Divonne-les-Bains, France; Baden-Baden, Germany; San Remo, on the Italian Riviera; and, briefly, Las Vegas. He became a regular in San Remo, where he had lucrative runs over several years. By 1969 he had become “a menace to every casino in Europe,” Robert Lardera, the San Remo casino’s managing director, told The Morning Herald. “I don’t know how he does it exactly, but if he never returned to my casino I would be a very happy man,” Mr. Lardera said. “There was nothing original in his method — only in the successful way he employed his fanciful computer explanation to delude the managements of European casinos, the gaming police and the general public,” the gaming writer Russell T. Barnhart said in a chapter about Dr. Jarecki in his book “Beating the Wheel: Winning Strategies at Roulette” (1992). Ms. Jarecki said that watching, or “clocking,” a wheel, as Mr. Barnhart described it, could mean observing more than 10,000 spins over as long as a month. Sometimes a wheel would yield no observable advantage. But when Dr. Jarecki and company did find a wheel with a discernible bias, he would have an edge over the house. Choosing the right casino was as important as finding the right roulette wheel. Roulette in European casinos offered better odds than in American casinos because wheels in Europe have 37 numbered slots on which the ball can land, while American wheels have 38. Dr. Jarecki also found that European casinos were more accommodating to players on hot streaks than their American counterparts. Some European casinos tried to end Dr. Jarecki’s streaks by switching wheels from table to table, but his memory could thwart them. He had memorized nicks, scratches and other telltale identifiers on individual wheels and thus could still recognize the ones he should play. News media reports at the time said that some casinos had barred Dr. Jarecki outright, but Ms. Jarecki said that rarely happened, in part because he had befriended casino officials and employees. Still, steady losses came to torment the San Remo casino, especially as others began betting along with Dr. Jarecki. Ms. Jarecki said that at one point Italian officials tried to keep them from entering the country, at the municipality of San Remo’s request. But they successfully appealed the decision, she said, and were back at the casino in a few months. “If casino managers don’t like to lose, they should sell vegetables,” Dr. Jarecki told The New York Times in an article about his win streak in 1969. When he returned to San Remo he ran the table again until management replaced some two dozen roulette wheels, negating his advantage. Moreover, roulette wheels came to be manufactured more carefully, offering fewer biases to exploit, and Dr. Jarecki’s edge began to ebb. He returned to the United States in 1974 and began trading commodities futures on his own, specializing in silver and gold. In the 1980s he was named a governor of Comex, a commodities futures exchange. He also continued to play roulette, as well as blackjack, in Las Vegas and Atlantic City. Ms. Jarecki said that casino owners sometimes asked him if he would like to partner with them, but that he always turned them down. “He likes to take money from the casinos, not give it to them,” she said. Dr. Jarecki was born to Jewish parents, Dr. Max and Gerda (Kunstmann) Jarecki, on Dec. 1, 1931, in Stettin, Germany. His father was a dermatologist, and his mother’s family owned a major shipping company. But with the rise of the Nazis and the growing persecution of Jews, Hitler’s regime took control of the family’s shipping fortune, and they fled Germany in the late 1930s, ultimately settling in the United States. He grew up in Asbury Park, N.J., where he graduated from high school and then studied at Duke University before returning to Germany to earn his medical degree at the University of Heidelberg in 1958. Dr. Jarecki met Carol Fuhse, an anesthetist, during a medical residency at a hospital in New Jersey. They married in 1964, and Dr. Jarecki worked as a medical researcher in New Jersey until 1967, when they moved to Germany. He studied electrophoresis at the University of Heidelberg when he was not at the casino. The WNBA season ended last night with the Seattle Storm easily beating the Washington Mystics to sweep the series. The other (almost) perennially profitable system is backing Road Favourites coming off a loss when playing an opponent coming off a win. While not quite reaching the heights of 2013, an ROI of 33.75%, albeit from a small bet total of 54, was solid enough. There are not enough matches in the WNBA season to make a relevant comparison, but for qualifying road favourites coming off a loss, the numbers are good. The ROI for the 2018 regular WNBA season was 27.3%, a big improvement on 2017's pretty decent 8.4%. 98.5% of the profits came from 30 Conference games this season. No guarantee of course that these trends will continue in 2019, but something to watch for next May. I'm sure I'll be looking at these numbers in more detail closer to the start of next season, but the trend to more three point shots and average number of possessions doesn't show any signs of slowing down. 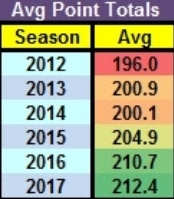 I would be surprised if the 2018 season numbers don't see the average climb still further. March and April saw the average at 214.6 points, which would seem a reasonable number. The real question is whether your average bettor, with whom you are in competition, will understand that higher points totals do not mean the value shifts to the Unders bet. It's quite remarkable that in the 2011 season, just one game had a points Total line greater than 215.5. Fast forward to 2017 when there were 431. At the 225.5 and greater level, since 2005 the Overs has a 58.1% record, and since 2011 a 61.3% record. 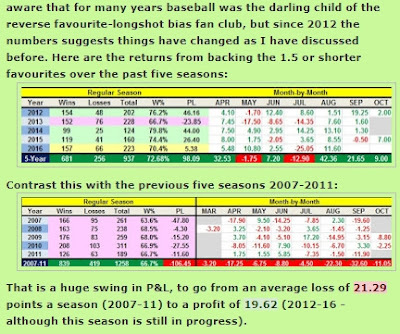 Backing 'Small 'Road Favourites in the NBA has been perennially profitable with just one losing season since 2006 as the season summary post illustrated, and after the WNBA last season had a 58% record on these games, this season went even better with 59.7%, an ROI of 16.5%. The season could end tonight as Seattle Storm lead the best of five finals 2-0 over the Washington Mystics, although the Mystics are 5.5 point favourites. Under 167.5 points at 2.02 is the value bet here. In WNBA playoff games, where the home team is favoured by five points or greater, Unders come in 57.1% of the time. I mentioned the advantages of looking at US sports in my last post, and there were a record number of qualifiers for the College Football Small Road Dogs system yesterday, with 8 winners and 6 losers. 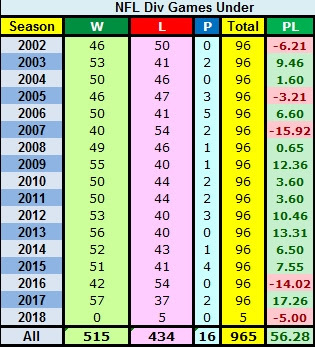 This system has had just two losing seasons this millennium, both by less than two points, and with an ROI of 7.24% it is well worth following. If you stick to Divisional games for this system, the ROI since 2002 (when the league expanded to 32 teams) is over 8% - and there is one such qualifier (Chiefs) today. In both College and the NFL, road teams receiving exactly a field goal are to be backed. In College games since 1996, these win 57.1% of games ATS, while in the NFL since 2002 the number is 55.9%. Contrast this with road teams receiving four points, where College is 50% and the NFL 48.5%.